The 271 Patent Blog: Book Review: "Patents for Business"
Book Review: "Patents for Business"
This is a good book for business/R&D managers who want to become more knowledgeable in the field of patents, and to understand the basics of patenting strategies and infringement. Written for non-lawyers, the book sets up the fundamentals of patenting in an easy-to-understand way. Eschewing formalities, the book quickly starts with claiming strategies that explain through examples how "the right to exclude" applies to various claim formats. Using some nice 2-D diagramming, Heines shows how claims "cover" elements of a product, and how infringement can be determined. 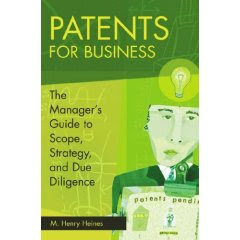 The book also explains concepts of Prior Art, Novelty and Nonobviousness (chapters 5-6), Freedom to Operate (chapter 7) and Patent Portfolio Referencing (chapter 8), along with other practical considerations for due diligence and setting up a patent regime for a company (including a short section on dealing with inventors/employees). There's even a glossary in the back that explains most every term you need to be conversant in IP, making this book a handy reference for anyone involved in product development, corporate strategy, or intellectual property. Your review of "Patents for Business" was right on the money. I just finished the book myself and, rather than rehash your review, I simply link to it on my blog. One thing I did notice is that the domain name PatentsforBusiness.com does not direct you to a website for the book but instead takes you to a company website that claims to be "dedicated to the development of patent portfolios aimed at meeting the objectives, needs and requirements of your business". Do you happen to know if there is any connection between the author and this website? If not, this underscores the importance of investigating potential conflicts with domain name registrations prior to any branding strategy-- whether that branding strategy be a new business name, product identity, or (as in this case) the title for a new book. The stock has gained 150% from Oct 8, 2007 to Oct 22, 2007. 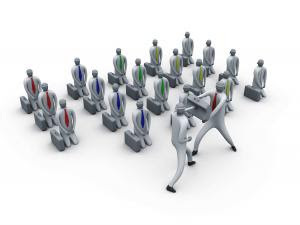 Patent Plaintiffs: W.D. Wisconsin Welcomes You! Continuation Rules "Dead as a Doornail"?